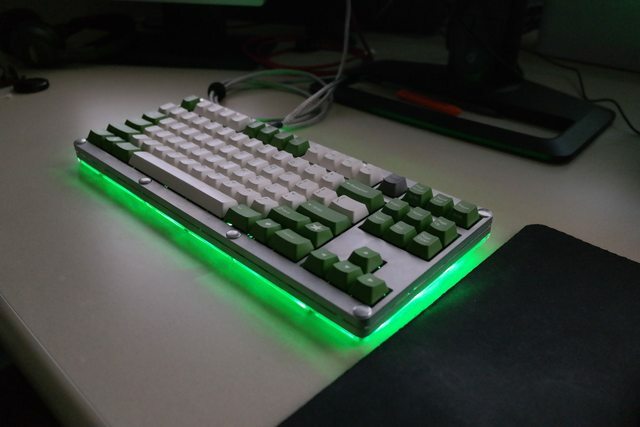 I'm getting that itch to create something new and I think that this time I'm going to go with a nice TKL layout. I've had this one in mind for a long time. It will be fun to see it come together. I'm going to document the whole process here. It will probably take a few months, at least. Hopefully it will be interesting. Despite usually building compact layouts (Epsilon, Zeta), I spend most of my time using a TKL layout at work. Even though I think it wastes too much space, I must admit that I am have committed the locations of the TKL keys to muscle memory. Also, it just looks good. It's time to make a TKL. 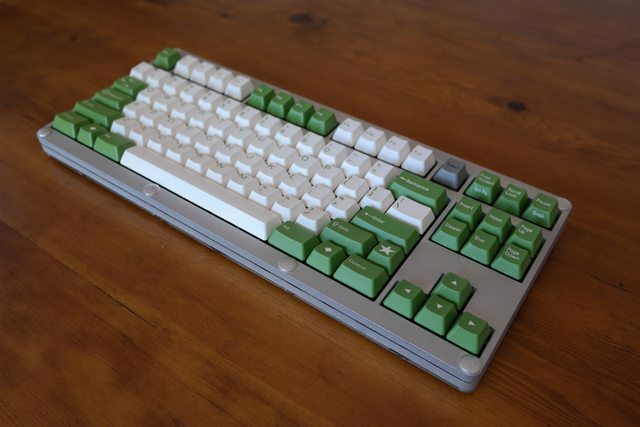 Start with a Leopold/Filco style TKL. This means the nav clusters are separated from the main layout by 0.25u and the Function row is separated by 0.5u. This differs from the Korean style which uses 0.25u for both. It also differs from the Realforce style which uses 0.5u for both. I like the way it looks. Switch from standard ANSI bottom row to that of the Realforce 87U. 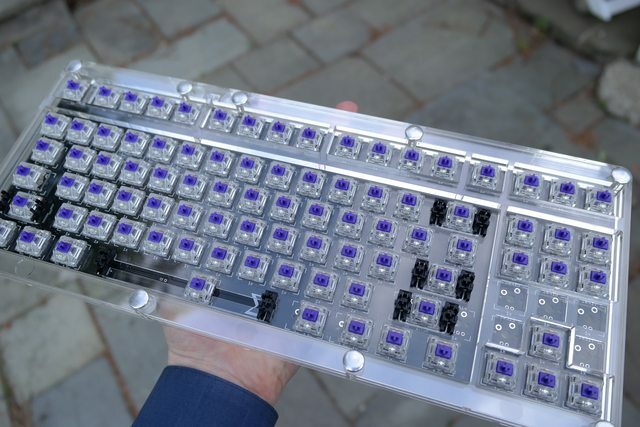 This uses winkeyless-style mods, 1u winkeys, and a 6u space bar. 6u is harder to find, but darn it, it just looks better than the too-big 7u. Use a Cherry-style offset caps lock. They look better. The 2.75u right shift key doesn't need to be that long, and 1.75u keys are easy to find. Shorten it to make room for a Fn key. The top row has too much open space, and I'd like another spare key to meddle with layers. Therefore, squeeze in a new modifier to the right of F12, similar to old DK Saver. The theme for this one is "lots of keys", so I'd also like to get the option to fill up the nav cluster with a full 5x3 matrix. 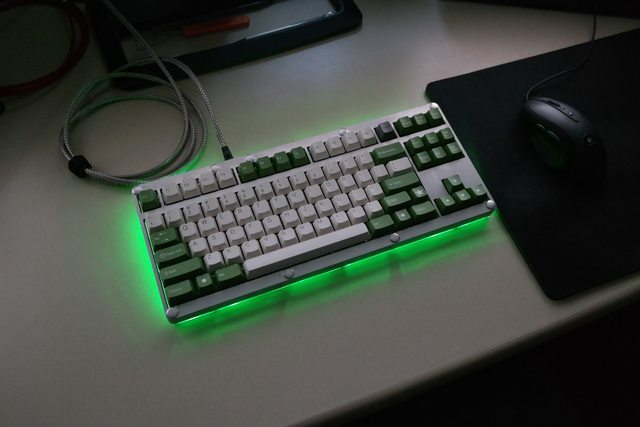 The result of all this is, in my humble opinion, the perfect TKL. The most complicating part of this layout is the 6u space bar. I want to use it because it leaves room for another key on the bottom row, and because the 6 just looks better. The 7 takes too much space and looks off-center. Unfortunately they are very hard to find. I have personally had two kinds in my collection. The first is the SP DSA with centered stems. I think these are non-standard. The second is the Cherry off-center stem. I have already dealt with this before on my Epsilon. They can be found on certain old MX and MY boards. However, I've yet to come across 6u stabilizers for sale anywhere. 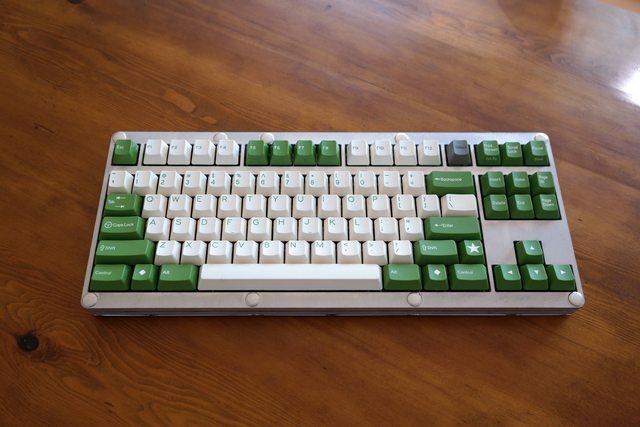 What really convinced me to give it a shot is that newer dyesub PBT sets are coming with a Cherry-compatible 6u space bar! I hope this means they will be more common now. Also, the Cherry-style 6u has the same switch footprint as the 7u, so that makes it fairly easy to construct a board that supports both. My PCB will allow both the 1.5-1-1.5-6-1.5-1-1-1.5 and 1.5-1-1.5-7-1.5-1-1.5 bottom row configurations. I always like to make boards that are a little quirky. If it was boring I wouldn't enjoy the job. I guess the 6u is one of my quirks this time around. As demonstrated with my Zeta project, I don't like to leave wasted space on the layout. The ANSI layout has 2u of empty space that I wanted to put to use. The layout here is similar to the top row of Zeta, where the three 'F' groups are still separated but are squished closer together. This leaves space for 1 more key. I think Num Lock is a good fit. It becomes useful when you fill in the nav cluster. With a filled nav cluster, you get a 3x5 grid that can form a mini number pad. The Num Lock could then be used to switch between a normal layer with arrow keys and PgUp/PgDn, and a number layer. This feature does a reasonably good job of fitting a full layout into a TKL size. To support this, I think I'm going to need a new feature in the firmware. Something that can watch for changes to Num Lock and switch layers accordingly. I chose the name Sigma because I just like the name of greek letters, but also a capital sigma is used as the mathematical symbol for summation. This PCB will be the result of the sum total of all my hobbyist keyboard experience. Therefore, I'm going to be using the ATmega32U4 again. In fact, the hardware is almost exactly the same as my Zeta project. The layouts are obviously different but the matrix is identical, except for an additional column on Sigma. In fact, you could load a Zeta firmware into a Sigma board and it would work just fine. I'm utilizing the same 4-to-16 line decoder for driving the columns and I'm again using four NPN transistors to drive the backlights. One of the benefits of just reusing the Zeta schematic is I already know it is bug free. That's a great place to start from. I like how full the matrix is, like nothing is going to waste. The only 'holes' are the locations of the ISO keys and the space bar. Like Zeta, there are 8 (!) indicator LEDs. Because of the new layout, I moved them around slightly. Esc, Caps Lock, and Scroll Lock still have one. Then, I placed one on each of the two 'bonus' keys where they are likely to be mapped to Function codes. That leaves the three on the bottom row, which are on the locations of the super/meta keys. I consider these spots other likely locations of Function keys. Of course all are lumped into the modifiers backlight zone if they don't have an indication assigned. Sigma will have the same backlight zones as Zeta: left-hand alphas, right-hand alphas, F-row, and modifiers/nav. This time around I am adding a new set of LEDs on the backside of the PCB. These will be used to illuminate underneath the keyboard. This seems very common now on Korean keyboards. I have positioned 15 surface mount LEDs spaced evenly around the outside of the PCB. They are set about 1 key length in from the edge. This should really look good in a dark room. Once again, the PCB design has a lot in common with Zeta. The placement of most of the parts is the same. This one really came together well. I'm proud of it. This is the largest PCB I've ever made. Hopefully it won't be too much more expensive. As usual, I'm getting it made at PCBWing. They do good work for a reasonable price. Once again I'm reusing the Zeta design. The case will be sandwiched acrylic but without the built-in wrist support. I liked the completely clear design of the Zeta case. It allows me to show off the innards of the keyboard without disassembling it. I'm going to make one just like it this time around but I'm also going to make one that incorporates aluminum. Big Blue Saw was running a sale on 0.25" water-cut Alu so I went for it. However, for all the detailed laser-cutting work, I now use Ponoko. Big Blue Saw has screwed up most of my past projects in some way. Ponoko can deliver some good work. Also, Ponoko is cheaper and faster. They cut my order in only a few hours. Big Blue Saw took more than 2 weeks to cut my order. Not cool, man. Parts finally came in so I can see if the design is going to work out. As usual I sourced parts from Digikey and McMaster-Carr. 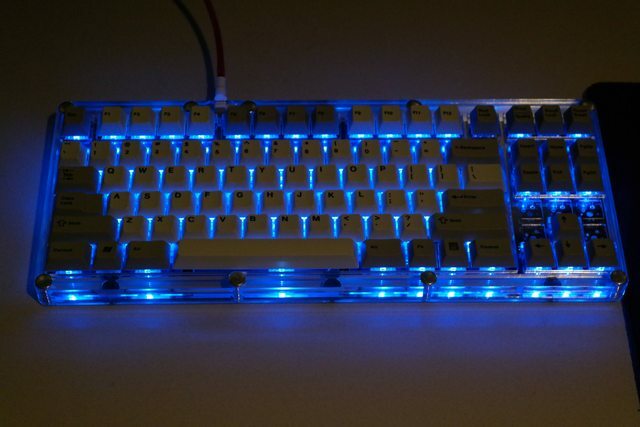 For this build I'm using some Zealio switches from a recent GB. For keycaps I'm using EnjoyPBT dyesubs from a recent GB. The toughest thing to source is the Cherry plate mount stabilizers. After fit-checking everything, lubing my stabilizers, and peeling off the protective coatings, I soldered in my switches. Here is a (potato) photo of the plate/PCB assembly. After some testing I was ready to put it together. Looking forward to whatever comes of this! Too bad the last one didn't take off. The last one was a resounding success. It works great for me! Ah yes, rub it in. I hope you're enjoying that unnecessary wrist wrest. Yeah I mostly liked how it came out, but this time there won't be a built-in wrist wrest. I want it to look more traditional. 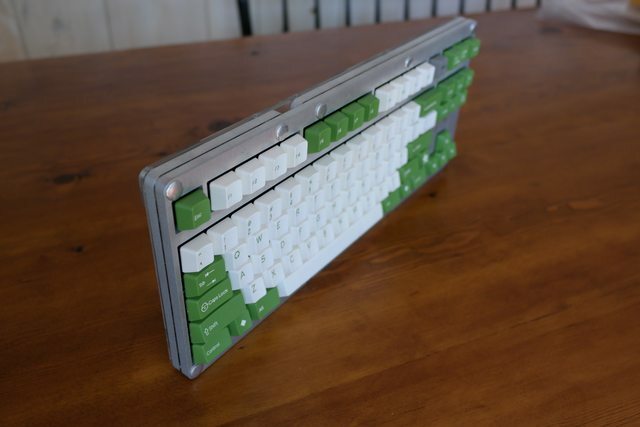 I wish I could get a milled aluminum case, but I don't have the connections for it. You make me wonder if the "end-game board" is even possible, or is it just a myth. **** yes! Another 'qaz build. Can't wait to see how this one turns out. No numpad but a numlock key? I think there is a FN numberpad on the right side of the base keys. So Number lock would enable those. Loving this layout! The only changes I would make personally would be to use 2x 1u keys instead of a 2u backspace, and include the "missing" five keys over the cursor arrows. You, sir, are in luck! Phantom has those. Yeah, that's pretty much it. Num Lock would enable a virtual numpad. Of course the key can be used for any layer reconfiguration. Doesn't have to be numbers. Could be ANSI <-> COLEMAK. Whatever. Dammit JD, now you've got me thinking... is it possible? It just may be. Starting to fill the page with some words. 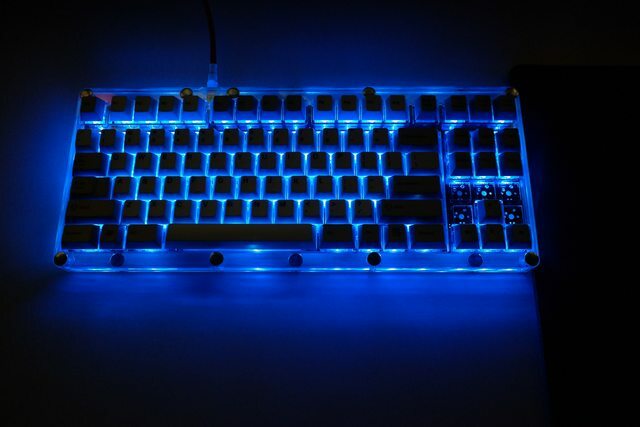 Question: does anyone know a good source of 6u space bars? Other than the enjoyPBT GB? 100% myth I thought my custom poker II was end game. Does anyone know a good source of windowed keys? I only need 1u, PBT preferred. I think it's going to be hard to find PBT, as these windowed caps are usually double-shot. The PCB is just about finished. I'm really happy with it. I need to have a chat with bpiphany about it. I need to know how he got away with overlapping holes. Looks great! I created a test board that had overlapping holes for switches that were 90deg apart. I ended up making a second switch footprint that had the pads swapped, so the overlapping holes were the same pad - assuming that's the problem that you're running into (like SW612?). Yes, that's the one. Unfortunately I can't rotate the switch because I'm using backlighting and it wouldn't look right. 2. Make an alternate footprint with swapped pin numbers. Yes, that's what I ended up doing. I didn't rotate the switch, just made a second footprint where the pads/nets were swapped like that. That's not my problem. The problem is that the large non-plated through hole for the switch overlaps one of the pads. It overlaps the whole pad? Or just part of it? Just part of it. I know it will work fine, the problem is that the fab says it violates design rules. How good are your soldering skills? Ahh, sorry, I misunderstood. Can you change that one drill into a regular over-sized pad instead of NPTH? I am making 2 of these PCBs for myself. An IC will determine if I order more than that at the same time. Maybe you can find someone to build you one. If you don't mind me asking, which fab? Most fabs now do support those, like PCBWing, seeedstudio. Pcbwing. That's good to hear. I love getting packages So many parts on the way. Having trouble sourcing 7u cherry plate mount stabilizers. Anyone know of a store that sells them? Does OLKB have the 7x stabilizers? They seem to be a good source of Cherry stabilizers these days. There's a new store on eBay that has them! Hopefully the shipment from China won't take too long. 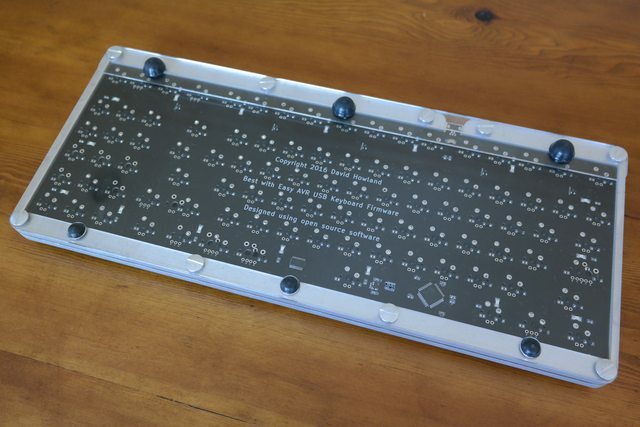 PCBs should come today and then I have to wait for BigBlueSaw to deliver my Aluminum. They so slow. Do you have a link for the stabilizers from eBay? I ordered from the same place. Hope their shipping is decently quick. The build looks great! I really like the way the pcb turned out. Got my stabilizers last week and the parts for the first case finally came in. Almost there! Well I've got the first one put together. I must say I like it very much. I used vintage MX blacks on this one so it is very smooth. Now all I have to do is post more of the build pictures. Page created in 0.133 seconds with 86 queries.